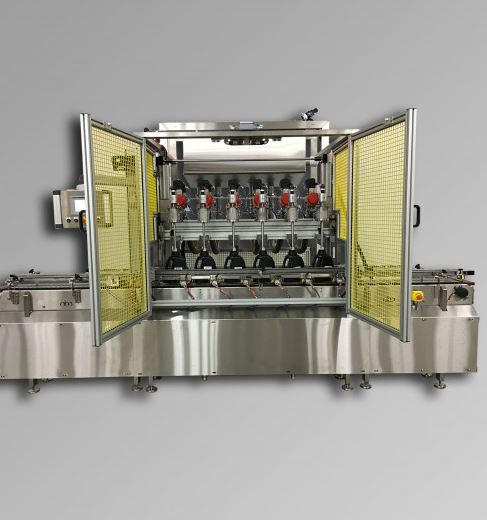 When the time comes to purchase a new filling machine or update an existing fill line, the first step is often determining which type of filling machine is best for your application. At ABA, we want to provide our customers with information that will help them make the right decision. Determine if a net weight filling machine or a volumetric filling machine is right for you below. Net weight machines utilize scales to weigh containers and fill until the determined weight has been reached. While these machines have less product contact and are thus easier to clean than volumetric machines, head for head, these machines will typically return about half the speed of a volumetric machine for containers 1 gallon and smaller. With the latest innovative technology, our net weight filling machines are ideal for customers who require data tracking or require highly accurate fills. Our volumetric filling machines are available with either 1 gallon or 5 gallon double acing positive displacement volumetric piston pumps. Double acting pumps have product on both sides of the piston which keeps the cylinder walls and seals lubricated and increases the life of the pump. These machines are fast, accurate, easily adjustable, and simple to clean. They are ideal for customers who prefer a less technologically complicated setup and who prioritize speed. With this information, we hope you can select the ideal filling machine for your needs. If you need additional information, you can call our team at (803) 396-0621 right now.